Description: Now in convenient 2-Packs! These chokes feature our brand new Triple Shot Technology. TST is a series of three graduated rings in the parallel section of the choke that allow a more gradual transition from the shotgun bore to the final constriction that conveys a host of benefits to the shooter like reduced pellet deformation a shortened shot string and less flyers. These choke tubes are non-ported. - You also get all the benefits of an extended choke tube including a 25% longer parallel section for tighter and more dense patterns wrench-less installation and quick removal and muzzle protection. They are offered in your choice of ported or non-ported configurations with a matte black finish. Like all of our tubes the Cremator series carries a lifetime warranty and are constructed out of our premium 17-4 stainless steel. 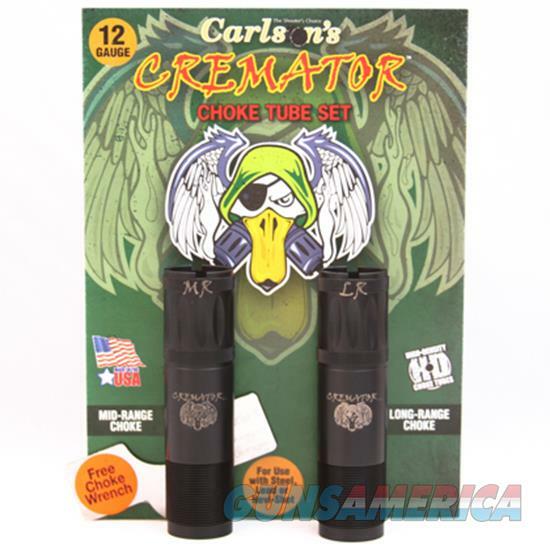 - Combine the spectacular performance of today's premium ammunition with this breakthrough in choke tube technology and you'll see why Carlson's new CREMATOR series of choke tubes is setting the shooting world on FIRE.